As I’ve continued my adventures in baking, pies have been somewhat elusive to me. It’s been hit or miss on whether I’ll like a “professionally baked” pie, so I hadn’t taken the leap in baking my own pies. I hadn’t taken the leap until I saw a recipe for mini blueberry pies. I don’t know if it’s because of that cupcake samples I got at Crumbs Bakery or those little mocha caramel brownie bites I made a few months ago, but for one reason or another, I’m in a “mini” baking phase. A phase where if it’s tinier than it’s supposed to be, I’m going to bake it. This week, I decided to tweak Lucky Leaf’s recipe for mini blueberry pies and make mini apple pies. Not only are we apple pie lovers, but this recipe allows me to bake up a lot of mini pies, which makes a lovely snack or treat for everyone. I’ve restrained myself and have only eaten one two three of them so far. If we run out before Valentine’s Day, this recipe is fairly easy, so I can always make another batch of these cute pies – perhaps with Lucky Leaf’s Strawberry Pie filling. Yum yum. Baby-sized apple pies packed with flavor. Preheat oven to 400° degrees. Unroll the 4 refrigerated crusts. 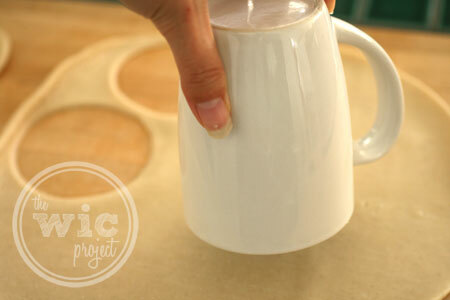 Using a ~4” circle cookie cutter (or even the rim of a glass/bowl), cut out 24 circles of dough. Spray the muffin tin with cooking spray. Lay a circle on top of each muffin hole and gently press down to the bottom and along the sides, covering the whole muffin cup. The side crust should come to just below the top of the muffin cup. Fill each with 2 large tablespoons of pie filling. Top with remaining crusts, using a fork to crimp the edges. Cut two small slits in the top of each pie to vent. OPTION: For a lattice top, instead of a round top, cut ½” strips of dough and lay down in an overlapping pattern to make lattice tops. 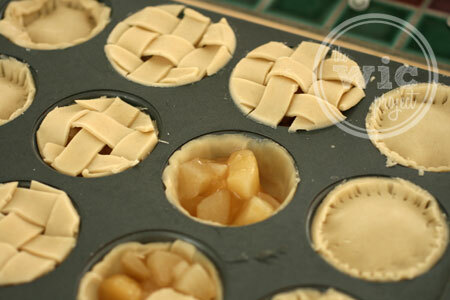 Use a pastry brush to brush the lattice of each mini pie with an egg wash (egg and milk combined). 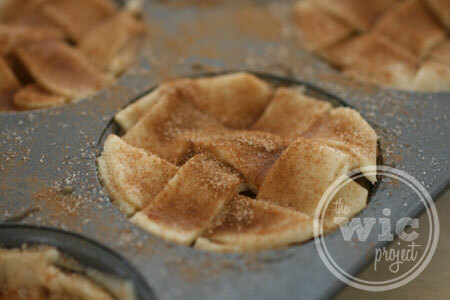 Mix together cinnamon and sugar and sprinkle on top of each pie. Bake for 16-20 minutes, or until they are golden brown. Let pies cool slightly before removing from the tins. Fortunately for me, this recipe calls for just 6 ingredients. Using the refrigerated pie crusts and the always delicious Lucky Leaf Apple Pie Filling makes this much easier than peeling and coring apples, making dough, etc. Not to say that I won’t bake a pie from scratch scratch, but for someone who’s not comfortable with pies yet, or for someone who’s short on time, this is the way to go. Next, it’s time to cut out our pie crusts. If you don’t have a cookie cutter that’s the right size or shape, you can use the top of a mug or cup to cut out the round circles. 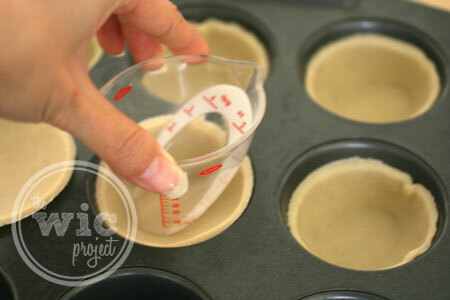 Place the round pie crusts on top of each muffin tin hole, then gently press the pie crust into the tin. I used a small measuring cup to help. 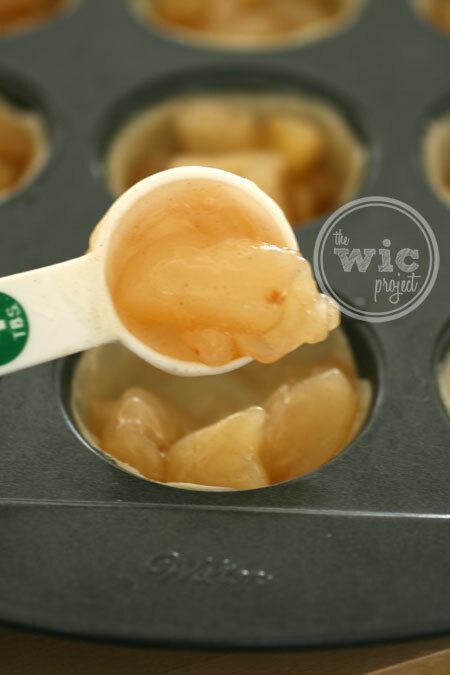 You can use a spoon or small measuring cup to help press the pie crusts into the muffin tins. Once all the pie crusts are ready, spoon 2 heaping table spoons of Lucky Leaf Apple Pie filling into each crust. Since the apple pie filling uses apple slices, I used a knife to do a quick chop of the filling into apple chunks. Mmmm. The Lucky Leaf Apple Pie filling is already seasoned. Once all the tins are filled, it’s time to top off the pies. You can use round tops using the circle crusts cut out with the cookie cutter, or you can cut strips of pie crust to make a lattice pie crust. I did a mix of both lattice tops and round tops. After everything is topped off, brush the tops of each baby apple pie with the egg and milk wash. Then top it with a sprinkle (or in my case, handfuls) of the sugar and cinnamon mix. It is my opinion that you can’t have too much cinnamon and sugar mix on pies. 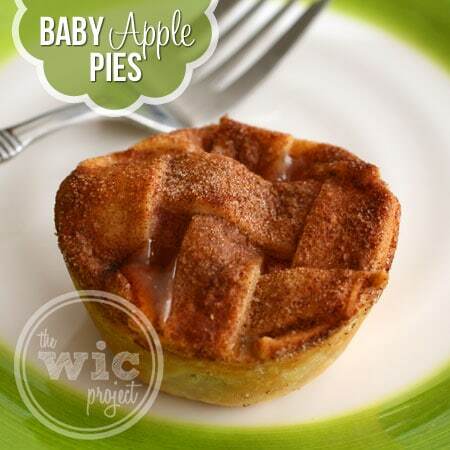 Pop everything into the oven and 16-20 minutes later, you have wonderful baby apple pies. Baking these pies made the house smell amazing. Eating these pies made my taste buds feel amazing. 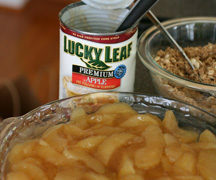 I love the warmth and flavor of the Lucky Leaf Apple Pie filling, encased in the crispy crust. I wouldn’t say these are bite-sized, although someone with a voracious appetite could probably eat one in two bites. Someone with more restraint could probably eat the pie in 3 or 4 bites. This recipe is so easy and tasty to make, that it would really make a great treat for that special someone or your entire family this Valentine’s Day. 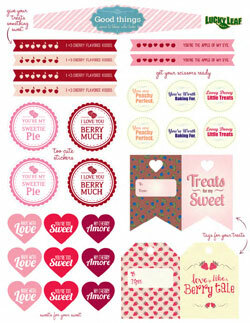 You can also use this handy Valentine’s Day Printables sheet to help decorate your Baby Apple Pies to be little more festive. To use the printables, print the sheet on card stock or adhesive paper, then trim around the edges. Cut out the whole using scissors or a one-and-a-half-inch circle craft punch and use a toothpick to wrap the flag banners. 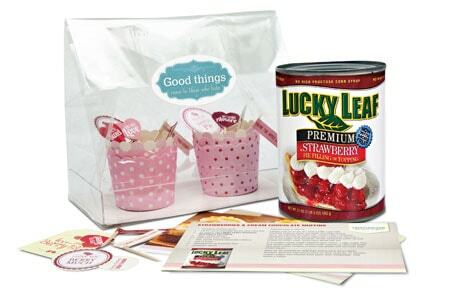 One winner will receive a gift package including a can of Lucky Leaf pie filling, a recipe card, fun and festive muffin cups and a bakery bag. My favorite pie is coconut custard, And I bake my pies. The little baby pies are so neat. Great idea, can’t wait to make some for my family.Thanks for recipe. My favorite of course is apple pie! I usually make my own pies. I love to bake. I make a wicked blueberry pie from our own blueberries. I do both bake and buy. My favorite is Key Lime. I love pumpkin pie but I usually buy it! Apple is my favorite but I am not good at making pastry so we mostly purchase them. I do both, my favorite is peach. I like making Cherry pie and its my favorite. My absolute favorite pie is my grandmothers apple pie/ Her pumpkin comes in a VERY close second! apple pie is my fave, I bake it sometimes and at other times I am totally lazy and buy it! My favorite pie is a peanut butter pie that my mom used to make. It’s so good. I do bake, but I don’t make a lot of pies, mostly cookies and quick breads. 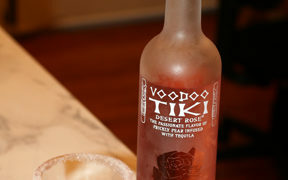 I am going to make this for my boyfriend this weekend!! He’s a cook, so he’ll be really surprised by this!! LOVE me some apple pie! I usually buy Sara Lee but have made from scratch. These look so twee and scrumptious! Perfect for a party dessert! A well made apple pie I guess is probably my favorite. I tried to make one years ago for my (at the time) boyfriend’s parents who were coming over for dinner. I had never made on before, and I was never really shown the basics of cooking or baking growing up, so this was a totally new experience for me! I followed the recipe exactly, and the spices were just right. I was so excited. Until the oven lit on fire. The recipe didn’t tell me to put a pan underneath for when the filling bubbled over. Basics, people! How would I know something like that?! Haha. Now I get homemade pies from the ladies that bake them at my mother-in-laws church. I make cobblers and crumbles, but not pies! I prefer to bake and I love keylime and apple! My favorite pie is the cranberry-pecan pie my mother makes! pecan pie by far my fave! Coconut Cream is my favorite! I love these small individual pies they are so cute. I can’t wait to use the recipe and make these with my daughter. My daughter would like to make these for Valentines in cherry I think they would be so cute. I like apple pies, and I bake them myself. I love all fruit pies, but blueberry especially, I do not bake them myself yet! These look so delicious, I’ll try doing this at home! I love homemade cherry pie! Who doesn’t love pies. I like apple and pumpkin. I love pumpkin pie, and blackberry and blueberry pie. I bake them myself! 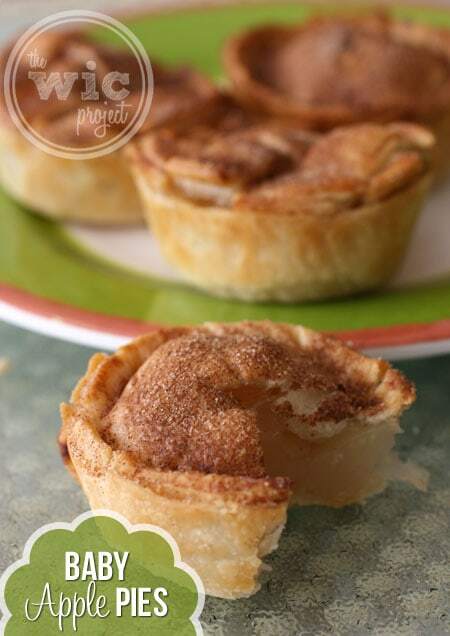 I love how you made the tops of the mini apple pies look like they fell out of heaven with the cinnamon and sugar.These little pies look pretty tasty. pumpkin or coconut cream. my husband does all the baking! I make an apple cranberry caramel pie that is my favorite! I usually buy pies but I have never thought of making mini ones 🙂 Peach is my favorite! I like strawberry pie with whipped cream. I bake it myself. 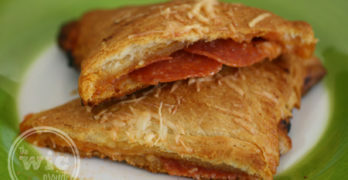 these look amazing and seem pretty easy to make. thanks. This looks so good, I’ll make these with the kids this weekend! My favorite pie is lemon meringue pie, which I bake myself! Coconut cream pie is my favorite. I buy it! I love Raspberry or Blackberry pies. I make them myself. Cherry is my fav but my family likes apple! I like making them myself! My favorite kind of pie is chocolate cream pie that I usually buy at the grocery store. I would love to start baking a lot more though, so this would be perfect to start off with! 🙂 Thanks for the great giveaway! I like baking them myself. Oreo Pie is my fave! My favorite kind of pie is quiche. I bake my pies. My favorite kind of pie is a Grasshopper “Pie” from Baskin Robbins! But when baking, I like Dutch Apple Pies. I love sweet potato pie! I both make it & buy it. I love apple pie, especially Dutch apple pie. Yum! Omgosh those are so cute and no mess with cutting the pie. I’m pinning this. My favorite is coconut creme pie. I buy except during the holidays I like to bake pies & cakes. I love lemon merengue, but I buy it! I love love love a banana cream pie! Or Cherry Pie! I’ll eat pie filling straight outta the can! 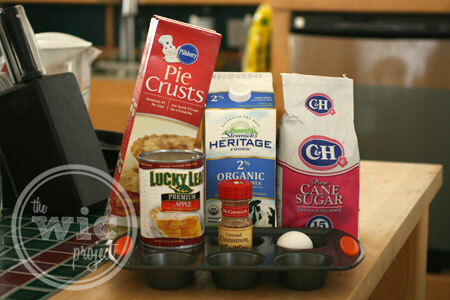 So generally I buy a pie crust and pie filling and bake my own pie. It’s semi homemade! my favorite pie is peach. i bake and buy. I have 2 favorites 🙂 my homemade chocolate pie and my homemade pumpkin pie. Cherry Pie is my fave and I bake!! I love dutch apple, and I usually buy them..
Key Lime pie is my fav. I love Dutch Apple Pie and usually make it myself. I have my favorite bakery I buy from! Apple Pie. I always prefer to bake over buy. Baking a homemade Apple Pie is my favorite. I love chocolate cream pie and I bake it or buy them. Cherry pie is my favorite. I bake and buy. My favorite type of pie is french silk pie. I generally bake my own pies instead of buying them. I love to bake cherry pie and cobblers. My favorite is lemon supreme and I both bake and buy. I LOVE these! SO much easier to make than a regular sized pie! Thanks for the recipe! I too have issues with pie-making. I’m very happy to see the crust isn’t my responsibility and six ingredients is surely my style! These are just adorable! I bet they would be good with just about any pie filling, like cherry, blueberry or heck even making mini chocolate or vanilla pies. SO cute. I think I just found my Easter dessert. Oh wow these are so cute, and they look wonderful ..This is a really easy recipe.. These little pies look amazing! Did you use mini muffin tins or regular size? Did you spoon them out to remove them from the tin without breaking them? These are adorable! They would be so cute in the little’s lunch box.